Butterfly gardening has become an incredibly popular activity. It is so easy, because all it requires is a little space and a few carefully chosen plants. It can be an extremely rewarding activity to carry out with children, who can experience hands-on science at its best while learning about topics like pollination, insect life cycles, and weather. We are so excited about it that we are going to devote a week of blog posts to butterfly gardening with children. 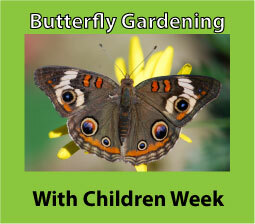 Monday: The basics of butterfly gardening with children. Tuesday: Figure out the five Mystery Seeds that will become great butterfly garden plants. Edit: The answers are now posted. See five great nectar plants for butterfly gardens. Friday: Adding trees to your butterfly garden. We made it through the week! Butterfly and Moth Activities at Growing with Science website. Kids Growing Strong is just one of the many websites that have information about starting a butterfly garden. The North American Butterfly Association (NABA) has an extensive list of plants for butterfly gardens. 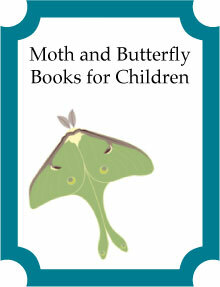 See our list of fabulous children's books about butterflies and moths at Science Books for Kids. Please join us and feel free to add links to your own posts, any questions, or ideas for topics about butterfly gardening with children in the comments. Hi, I will be going to Tanzania soon to work with a school age program promoting conservation and environmental responsibility. I am looking for some DVD's and other resource materials that would be good to bring along. I am especially interested in creating butterfly gardens and toad habitats. Do you have any suggestions?